The year was 1967. Canada's Centennial Year. A time to celebrate the past. A time for new beginnings. And it was also the year that a certain roving troubadour, one remarkable woman, an Ottawa Valley town and a hotel that exists there all came together to make history.Canadian country music icon, Stompin' Tom Connors refers to the century old Mississippi Hotel (that still stands guard on the corner of Bridge Street and Lake Avenue although it's name has been changed to The Carleton Heritage Inn) in Carleton Place ,Ontario as the "Grand Ole Lady." And he has good reason to have fond memories of this treasured Ottawa Valley landmark. This is because he wrote one of his very first hit songs there and Stompin' Tom is not the kind of man that forgets easily those people and places that have helped him along the way. The song he wrote there was the great Ottawa Valley tribute tune, "Big Joe Mufferaw." On a warm summer's day in early June a relatively unknown singer by the name of Tom Connors rolled into Carleton Place driving his pickup truck and parked it out back behind the legendary establishment. He walked inside carrying his guitar and a piece of plywood. A group of four men were sitting around a table and Connors bought them all beer with the understanding that they would cheer him on when he auditioned for the owner. 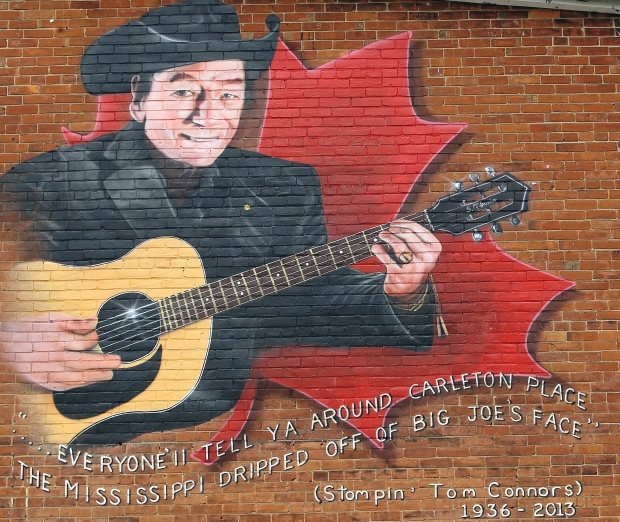 The owner was the unforgettable (and inductee to the Ottawa Valley Country Music Hall of Fame) Lorraine Lemay.Connors got the job and a month long engagement set the stage for the launch of Stompin' Tom's recording career. People talk of this tall lanky man's time in the Carleton Place area to this day. In those days Stompin' Tom would sleep on a bed that he had set up in the back of his pickup. After much convincing on the part of Ms. Lemay he agreed to accept her offer of a room in the hotel. "He just didn't want to be a burden in any way." Lemay said in an interview several years later. Lemay also recalled how he worked on the lines of "Big Joe Mufferaw" day after day. "He kept asking me" she recalled, "do you think it's any good Mrs. Lemay? Do you think its any good?" Two years later that song could be heard on every country music station in the country. UPDATE: Stompin' Tom Connors passed away of natual causes March 6th, 2013. Stompin' Tom was a true Canadian and cultural icon. 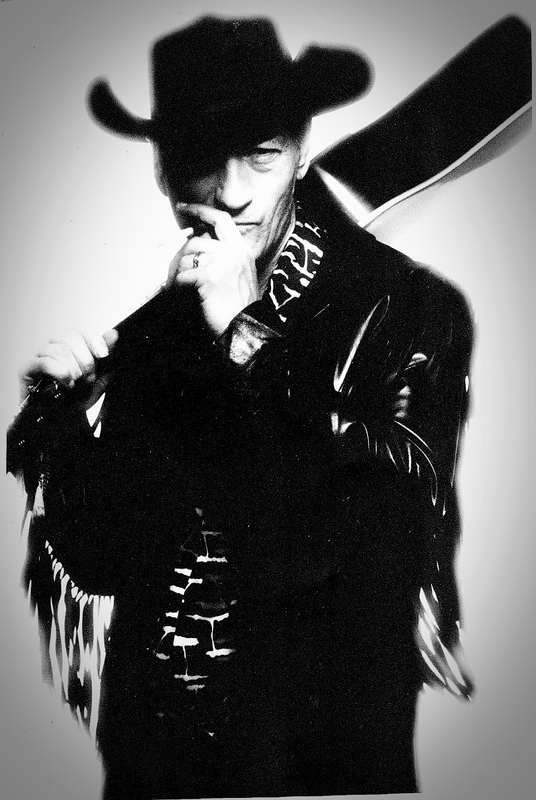 Thank you Stompin' Tom for your music and your love of all things Canadian. On May 20, 1910, the Town of Carleton Place endured one of its worst disasters in the history of the Town. 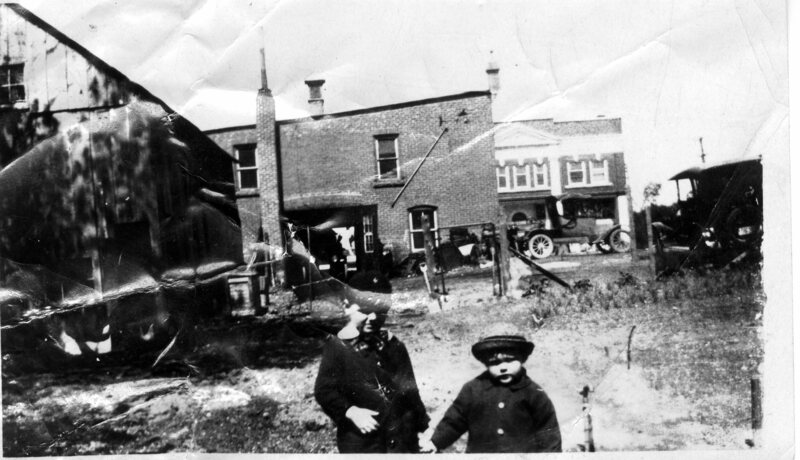 Shortly after midnight on this day, a fire broke out in the rear of the Cameron Brothers meat shop located at the corner of Bridge Street and Albert Street. The fire spread rapidly down Albert Street due to very high winds. Before it was brought under control, 35 buildings had been destroyed. Among the residences completely destroyed was that of the late James Gillies located at the corner of Franklin and Judson Street. It was one of the finest homes in town. The curling rink and militia drill shed located in the same area were also destroyed. The entire block bounded by Beckwith, Judson, Franklin and Albert Streets ended up in a heap of ruins other than lattice work in the rear of the home of Mrs. James Gillies. The area where the curling ring and militia drill shed were located were turned into a Market Square once some of the cleanup took place. Four short years following the fire, WW1 broke out and within two weeks, the town’s first dozen volunteers under Captain William H. Hooper left Carleton Place along with other volunteers throughout the Ottawa Valley. War news and war service dominated the local scene during this time including that of the manufacturing and gathering of war supplies being sent overseas. In 1919, members of our Armed Forces returned home, but not without heavy casualties. We here in Carleton Place lost 47 of our own during this war along with others who succumbed to injuries they sustained during the war. It was a result of the war efforts of our local volunteers, that our Town Council on September 20, 1920 passed by-law #829 to appoint a Memorial Park Commission. The members of this appointed Commission were given the challenge of erecting a Memorial in honour of those who paid the supreme sacrifice in the Great War and also of those who risked their lives to preserve our great liberty. The by-law also stated that the heirs of the late James Gillies had presented the Town with that portion of his real estate adjacent to the Market Square for such purpose. It further stated that a fitting and lasting Memorial in this regard would be the making of a park by joining the Gillies property with the Market Square to be called “The Memorial Park”. The local Captain Hooper Chapter of the IODE also became involved in this project and donated funds for the installation of a water fountain and erecting a grey granite Memorial to commemorate those from our Town who paid the supreme sacrifice during WW1. The work on the original portion of the Cenotaph was completed in 1924. 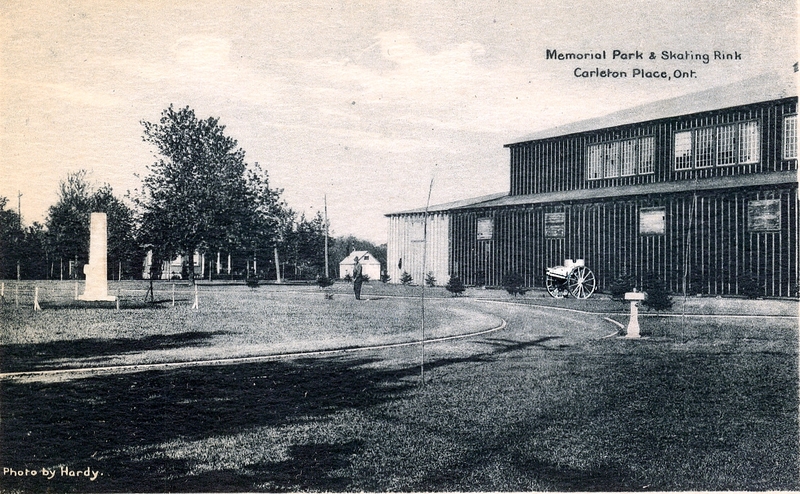 On May 24, 1924, Mary McDiarmid, along with her son Leo, a WW1 Veteran unveiled Carleton Place's original Memorial. Mrs. McDiarmid had lost three other sons during WW1. In 1960, two additional wings of grey granite were added to the Cenotaph to honour those from our community who paid the supreme sacrifice during WW11 and the Korean War. In 2009, members of the local Branch of The Royal Canadian Legion formed a committee made up of members from the Legion as well as a member of the local IODE and Town Council. The purpose of this committee was to raise funds to have the local Cenotaph restored and expanded. Through their efforts, a ceremony took place in October of 2010 to rededicate the restored and expanded Cenotaph and unveil the naming of Veteran’s Way, the portion of Franklin Street bordering Memorial Park. In June of 2013, a further ceremony took place to dedicate the addition of two C-1 105 mm Howitzers positioned at each side of the local Cenotaph. These two Howitzers replaced the the WWII Howitzer had been located. The local Cenotaph is owned by the Town of Carleton Place and is registered with the National Inventory of Military Monuments. Memorial Park is maintained by the Town of Carleton Place and Branch #192 of The Royal Canadian Legion. It continues to serve as a living memorial to those from our community who paid the supreme sacrifice as well as to all those from our community who have served our community and our country in the Canadian Forces. 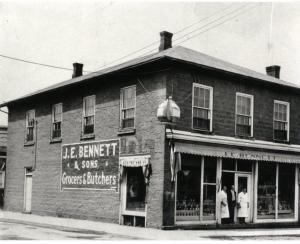 James E. Bennett had no way of knowing that the small butcher shop he opened in the late 1800’s would see four generations of Bennett’s in the business before the final chapter closed on one of the best known butcher shops in the Ottawa Valley. Old photographs show a wiry, golden haired man of moderate stature. He was born in Ferguson’s Falls in 1860, and came to Carleton Place as a child of 9, supposedly to take over his father’s blacksmith shop when he was old enough. The shop was located in the empty lot between the Valleytown apartments and the first stone house going west on High Street, which is now a private parking lot. But young James had no intention of becoming a blacksmith. In an era when it was expected a son would follow in his father’s footsteps, young Bennett went off to be a herdsman for a well known businessman G. Arthur Burgess. Around 1884, James E. Bennett decided being in business for himself would offer much more reward than looking after someone else’s cattle. And so the first Bennett’s Meat Market opened its doors. The store was located where Goofy’s Ice Cream parlor now stands. The spot was considered a prime location. Here some of the main businesses of the day were neighbors and a steady stream of people passed the shop each day. He hired Charlie Devlin to help out and the two of them did all the work…and it was all done by hand in those days. One side of the shop held a large plank anchored just down from the ceiling. Huge meat hooks held beef quarters, where the lady of the house could come, look over the selection and make her choice. Hand saws prepared the meat, because electricity was yet to come to Carleton Place. A two wheel cart, hauled by horse, carried a box with a lid on the back, and a step for the driver; from the cart, deliveries were made all over town. James E. Bennett soon outgrew the small shop next to the bridge. An opportunity came up to move across and down the street, and the young businessman jumped at the chance. He took his three sons, Harry, Gordon and Austin, “Onnie” into the business with him. It was a location that was to see almost 70 years of continuous business by the next two generations of Bennett’s. The store was a massive stone structure (unchanged today) that stood on the corner of Bridge and Bell Street. It was distinguished by a huge tea pot that hung from the corner of the store between the first and second storeys. The pot advertised Salada Tea, and one day in the 20’s when the town was celebrating Old Home Week, Ted and Jack Voyce climbed a ladder and painted the massive tea pot red commemorating the event. No one knows where the tea pot is today. In the very early days, before Bennett’s built their first abattoir, the shop had to close down in the afternoons so that the butchers could travel the countryside buying their meat. They would arrive at the farms, strike a deal, slaughter what they had bought, and head back to town. The first abattoir was on the 7th line of Ramsay near the old lead mines, and almost back to back with the Anglican Cemetery. In the winter time, the store also closed in the afternoon, but then it was time to haul ice from the Mississippi River. The shop had an ice box, and two ice houses held the year’s supply. Each day, ice had to be hauled into the shop to fill the ice box. The Bennett’s didn’t have that problem in the winter. The butcher shop was so cold the meat froze overnight, and stayed frozen all day. All the Bennett’s, right from that first James E. who started the business in the 1800’s possessed a wonderful sense of humor. James’ grandson Bill, remembers a woman coming into the store for a quarter’s worth of cooked ham. It was a blistering hot day. Bill’s grandfather James looked her square in the eye and said, “Hell, lady I wouldn’t open the fridge door for a quarter on a day like this.” Apparently, the ice would melt as quick as you would look at it, and Bill says if his father was going to open the ice box door, it was going to be worth his while. James E. Bennett built three houses in the Flora Street area. One of them is occupied by his grandson Bill and his wife Lois. Behind the house were stables where up to five horses were housed. They were used as delivery horses for the meat market, and they knew the routes as well as the men who drove them. One old horse, the story goes was so familiar with the routine of the business that when Findlay’s Foundry whistle blew at 12 noon, the horse headed for Flora Street with or without the driver. “You better be on that cart when the whistle went, or the horse went home without you”, was the saying of the day. In the morning a delivery man went door to door picking up order for meat. There were no telephones, and this was the way the business ran. The lady ordered from the delivery man, he rushed back to the store, filled the order and rushed back out to deliver it so she could cook it for the noon meal. Ledgers of the day reflected the simple way of life and how business was carried on. Some entries carried only the first name of the customer, or it might simply state the last name and beside it how much was owed. It could read “Bells…12 cents”. The amounts were small, and when the account was paid, there was no receipt given. A simple pencil line through the entry showed the debt was cleared. There was co-operation between the shops too. Sometimes a ‘debtor’ would leave a shop in a huff…invariably it was over a bill. Bill says, “someone would rush over to the other butcher shops and say Mrs. So and So left us and she owes .40 cents. As stated in a previous story, much business was carried on in a reciprocal manner. Bennett’s had agreements with at least two other merchants in town. Cameron’s blacksmith kept their horse shod, and Bennetts supplied their meat. Once a month a tally was made to settle the difference. The same system worked with Nichols Mill. The mill supplied all the lumber Bennett’s needed, and the meat market filled the Nichols meat needs. Once a year, the two businesses would have a reckoning. The tallies were usually just a few dollars apart. They’d say, just forget it. Wipe the slate clean and let’s start over again, Bill Says. After James died, his three sons took over the business. By the time the second world war broke out, Onnie was on his own as everyone who worked for him joined up, leaving no staff to run the store. Young Bill was taken out of school in Grade 11. He was to remain working alongside his father for more than 40 years. 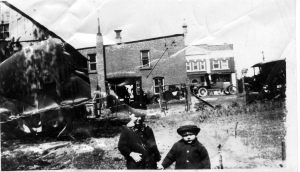 The first electricity the store had was purchased from Art Burgess who built a small power plant east of the present Medical Centre on Lake Avenue. Burgess sold power to several industries and businesses before the town was hooked up to outside power. For the first time Bennett’s were to have electric refrigerators. It was perhaps the biggest improvement ever seen in the business. As a young boy Bill always had a pony to the envy of all his friends. “But Dad had an ulterior motive in buying me a pony and cart. It was his way of initiating me into the business at an early age, because while everyone else was out playing, I was expected to use the pony and cart to deliver meat,” he says. Prices went up during the 40’s. They were a far cry from what they were in the early days of James E. Bennett, according to early ledgers. Two pounds of beef sold for .14 cents; two and a half pounds of steak for .23 cents, and pork chops and sausages for .12 cents a pound. As the seventies came to a close, the Bennett’s Meat Market was approaching almost 100 years of continuous operation. Onnie was ready to call it quits. And so was Bill. The business was sold in 1978 ending an era unmatched by any other retail business in the town’s history. James E. Bennett had established a reputation for honesty and service early in the game. It was carried on for three generations. The businessman left his mark politically as well. Like almost every other merchant he took his turn in municipal politics, holding the office of mayor from 1904-06. He set a pattern for what he expected the business to be…a service industry that met the needs of the town honestly. He probably expected his sons, grandchildren, and great grandchildren to carry on as long as they were able to do so, and in the same fashion. Had he lived, he would not have been disappointed. Today, the old stone building still serves as a meat market, as Danny Joly continues to meet the same high standards set by that original butcher more than 100 years ago. James E. Bennett would be pleased. Note: Since the printing or this article in 1987, unfortunately the meat market closed that was located in the old Bennett's Meat Market. The building at the corner of Bridge and bell Street now houses the Hing Wah Restauant. The following is an interesting story of the history of the Lime Kiln on Napoleon Street in Carleton Place. If you drive up Nepoleon Street today ( off lake Ave) you would never know that this historic industry and thriving business existed on the street at one time. 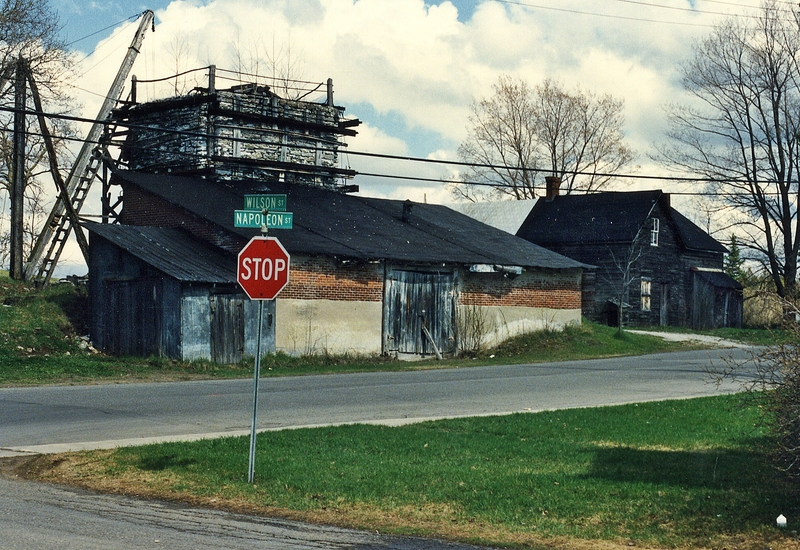 The kiln and adjacent buildings were demolished in the late 1980's, and some years later residential units were built on the site. The Ottawa Valley, and particularly Lanark County was fast gaining a reputation in the lime industry just before the turn of this century. An enterprising local industrialist, Napoleon Lavalee (after whom Napoleon Street was named) capitalized on that reputation and built what was to be a long lasting, Carleton Place industry. When the end product was realized, lime was carted off to help build some of the most prestigious buildings in the Nation’s Capital. Napoleon Lavalee built the first kiln on the very site of the present one in the mid-1800s. It was a crude affair, but served the purpose well. Many years later the new owner Bill Cameron updated the equipment, and laid the foundation for what was to become a major contributor to the lime industry in Eastern Ontario. The stack kiln Bill Cameron built was more efficient than the “pits” put in by Napoleon Lavalee. They rose high in the air, looking like big chimneys. New buildings were added to smooth out the operation, and for many years…going into the 20s, Bill Cameron was able to offer steady employment to a clatch of hard working employees. Then the 30s rolled in with all their ramifications. There wasn’t an industry untouched by the depression. There was no exception. But Bill Cameron was a very unusual man. He felt for his employees, most of them trying to support big families on meager wages. To lay them off would have been devastating. Margaret Lesway Henderson was just a little girl when her family moved next door to the lime kiln on Napoleon Street. She remembers very clearly those depression years. And she especially remembers how Bill Cameron did everything in his power to keep his men working. The lime business had slowed to a crawl. So the men were sent to the bush lots to cut cedar. Cord after cord of cedar was hauled into the yard. 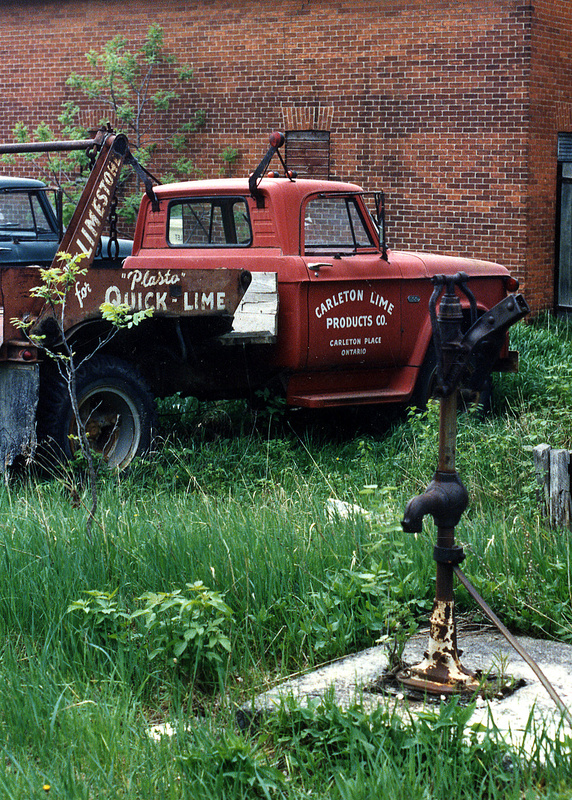 Bill Cameron must have wondered if he would ever use it all, when, and if the lime business ever picked up again. “I was just a young girl, but I can remember so well those huge piles of cedar. And every day the workers would haul in more. Mr. Cameron stock piled the wood just to keep his men employed, because the alternative was to lay them off, and that would have meant terrible hardships for many of the town’s families,” Margaret recalls. George Briscoe of Beckwith Township was Bill Cameron’s shanty man. Through good management, the business held on all through the 30s. With the 40s came a new interest in the lime business, and prosperity. In 1944, Bill Cameron was ready to call it quits and he sold the Lime Kiln to another enterprising young businessman, Stuart Neilson. The Napoleon Street business saw its greatest changes after Stuart Neilson took it over. He moved it from a piece meal operation to an efficient, more scientifically run business. It became a 24 hour pursuit. It was moved from a rather primitive procedure to a sophisticated performance that saw many changes and innovations in the Napoleon Street business. The procedure had to basically remain the same, but Mr. Neilson made vast improvements. He changed the shape and the functions of the kilns and was able to produce twice as much lime as the old time kiln. However, many of the jobs leading up to the burning didn’t change or changed only marginally. Trucks replaced the horse-drawn wagons for hauling the limestone into town from the 4th and 5th concessions of Ramsay. Shirley Sheinfield can still see in her mind’s eye those trucks lumbering up past her house on Napoleon Street, and the familiar sounds relative to the procedure of burning lime. “You heard this steady ‘bang’ all the time. That was when the big pieces of limestone would be dropped into the kiln. It was like thunder, and it was constant,” she says. She also remembers a horse by the name of Queenie. The horse was used to power the winch which hauled the limestone up to the top of the kiln. “Queenie was kept in a field across the road. Of course, there were no houses there then…just an open field. And I can still hear the man who drove the horse yelling ‘giddyup Queenie’. I guess those are sounds you never forget, because they were so constant”, Shirley said. John Neilson, Stuart’s son, remembers the horse powered winch very well. He was just a young boy when his father put him to work. “My job was to drive the horse to operate the winch. It was a simple operation. 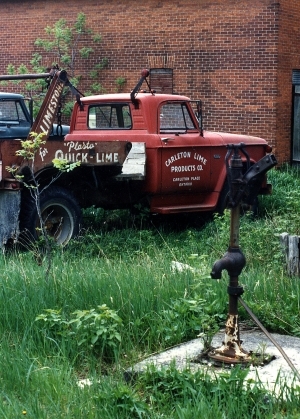 The lime was broken into big chunks in the quarry, then transported into town on the trucks. This breaking process was done by hand with big mallets. Then the pieces were loaded into big steel boxes. The horse was driven in continuous circle to wind up the cable which hauled boxes to the top of the kiln. Then the boxes of lime were tilted at the top by a tripper, and the limestone fell down into the kiln for burning. But it was my job to keep that horse going”, John remembers. He also remembers his father as being a hard task master. There were no privileges just because he was the owner’s son. “He demanded when I did a job, that it had to be done right, or I would have to do it all over again”, he recalls. Margaret Henderson remembers the yards as a great place for adventure. There were many things to interest a young child back in the 30s. Piles of stone were everywhere, and the robins and ground sparrows used to build their nests in the piles. “We used o position ourselves in front of the piles and watch the birds in their nests. We would even see the eggs hatch out. I remember the horse too. I’m not sure if it was Queenie, because the horse I remember never had a driver. It just knew and would slow down or stop altogether, and then the man on the top of the kiln would let a roar out of him, and the horse would start up again. I can remember that. We used to think that was very funny. Our biggest joy was at Christmas time. Those sleighs filled with limestone would go up the street, and we kids would run and jump on the back of them and get a ride. We loved that. We weren’t allowed to go back where the lime was being ‘drawn off’. That was considered a very dangerous place for a child. But I remember one time two young lads were back there where they weren’t supposed to be. Well, one dared the other to jump in the ashes which had been taken out of the bottom of the kiln. You’d never know they were hot to look at them. The young lad jumped in and he was very seriously burned. He spent months in the hospital, I know. We were never allowed back there, and I don’t know how those got there, but they did”, Margaret reflects. John Neilson remembers when the business ran 11 months of the year and employed up to 15 men. “Dad kept it going 24 hours a day. We fired with slab wood, and it took a lot to keep it going, but it was a big business right up to about the mid-60s, and hauling in limestone was stopped altogether in the early 1970s”, he said. By the time this account of the lime kiln is read by Canadian subscribers, most of the antique equipment will have gone on the auction block. A sale today (Wednesday) will all but eliminate the workings of the Lime Kiln. Old machinery, an antique truck, bits and pieces of history of one of the town’s long time industries will have gone to the highest bidder. But that’s exactly what is going to happen to whatever remains after the auction sale today. John Neilson said the last fragments of the yard will eventually be cleared away. When the final board is hauled away, all that will remain will be memories. Lime is still being manufactured. But the process is much different. The calcining remains the same, but large rotary lime kilns have replaced the primitive stacks. It will take a long time to clean up the final remnants of the business Napoleon Lavalee started almost 100 years ago, but the memories of the site will remain with many for years to come. In 1906, Albert Lowe purchased the front half of lot 11 in section C of Carleton Place, located at the corner of Bridge and College streets. The lot was part of the land granted to Edmund Morphy by the Crown in 1819. Edmund died in 1842 and the parcel of land was inherited by his wife Barbara. In 1848, she sold lots 1 through 24 for £450 to James McDiarmid, a general merchant and Allan McDonald, owner of a woolen mill in Carleton Place. In 1850, they sold the parcel to John McEwen for £500. There were no buildings on lot 11 as late as 1863. In 1867, Edmund Bourke, a cooper, sold lot 11 to Archibald McArthur, a Carleton Place merchant and former reeve of Beckwith. McArthur became the owner of a woollen mill and large stone residence in Carleton Place. In 1873, he sold part of lot 11 to John Bourke, the son of Edmund, for $400.00. John sold the front part of lot 11 to Albert Lowe in May 1906 for $2000.00. Albert Lowe, an Irish Protestant, sold his farm in Pakenham Township about 1890; he started a livery business in Carleton Place about 1894. 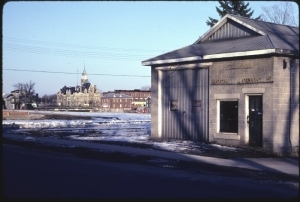 In 1906, Lowe’s livery building was located on lot 18 in section C of Carleton Place; he sold the business to Mr. Angus McFarlane. In 1906, a wooden building stood on the front part of lot 11 facing Bridge Street. The small structure was not suitable for Lowe’s purposes; he undertook the construction of a two story brick building on the property. Mr. Lowe made purchases in August and September1906 of 18,000 “h” bricks and 26,000 “s” bricks from Carleton Place Brickyard. Ten years later, in August and September, 1916, Lowe had business dealings with William A. Nichols, the owner of a lumber plane mill on Moore Street. Lowe’s livery business was listed in the 1918 telephone directory; however the 18 March 1918 issue of the Almonte Gazette reported that Mr. Lowe sold his livery “barn” in Carleton Place to McGregor Bros, to be used as a garage and machine shop. (Lowe’s daughter, Irene, was married to Colin McGregor.) The land register for Carleton Place does not record a transfer of lot 11 from Lowe to McGregor in 1918, so the building referred to in the article was located elsewhere in Carleton Place. The newspaper article states that Mr. Lowe intended to dispose of his livery outfit at an early date. Indeed he did not sell the red brick building located at Bridge and College streets until 1925, after it was converted to a car repair garage. Perhaps, Mr. Lowe or the McGregor brothers did convert the livery building on lot 11 into an automobile garage and operated a car repair service out of it for several years between 1918 and 1925. Norman Leslie Bowland and Stanley Edwin Shannon bought Lowe’s garage building in 1925. The Bowland and Shannon families were neighbours on the Scotch Corners road in Ramsay Township just a mile or so off highway seven. Norm Bowland was born in 1896 the son of William J. and Evangelia Bowland. Norm had worked for James Brothers in Perth before taking an automobile repair course in Ottawa. He moved to Carleton Place after completing the course and lived on John Street. He was twenty nine when he partnered with his friend Stan to purchase the garage from Mr. Lowe. Stan Shannon may have worked in the Bates and Innes Wool Mill before teaming up with Norm to buy the garage in Carleton Place. He may also have worked in a wool mill in Renfrew. The purchase of the garage for $4500.00 was finalized on 9 October 1925, the occasion of Stan Shannon’s 23rd birthday. Norm was the mechanic and Stan served gasoline and did grease and oil jobs. Albert Lowe may have first used the name Central Garage to describe the building he had converted into a garage sometime after 1918. It is certain that Bowland and Shannon were using the name by 1934 when their business is listed in the Carleton Place Directory as Bowland & Shannon, Central Garage. The name Central Garage continued to be used during the ownership of the business by Mr. Melvin Kyre from 1947 to 1949 and Mr. Alfred Skillen from 1949 to 1956. It may have been in 1932, that the front of the first level of the building was altered to accommodate gas pumps under the second storey overhang along Bridge Street. An advertisement in the Carleton Place Directory for 1936 describes Central Garage as the Red Indian Service Station located at 32 Bridge Street W.
Ross McCall a resident of Carleton Place tells a story about the time a farmer from Scotch Corners brought his car in for repairs. When the engine cover was lifted a chicken was in the engine compartment. The bird had succeeded in holding on during the drive into Carleton Place without incurring injury. The Great Depression came only four years after Bolland and Shannon purchased the garage. Perhaps a need to reduce their costs caused them to live on the second floor over the garage. Another undertaking to increase income was their decision to rent space at the front of the building to Ernie and Hope Peden and Russell Cooke for the purpose of selling cars. Stan and Norm charged a rental fee of $20.00 monthly and they also benefited from servicing the Star and Durant cars sold by Peden and Cooke. The Carleton Place Directory for 1936 identifies Mr. James Miller as the proprietor of a Dodge and De Soto dealership with a general automobile repair shop located at 157 Bridge Street. Sometime later, Miller operated the Dodge and Desoto dealership with Norm Bowland from Central Garage. He employed Helen Cole in the office. Stan Shannon seems to have left the garage business by this time perhaps to focus on the small grill and coffee shop he had recently opened at the front of the building. Mr. Miller was not selling cars from Central Garage after 1945. 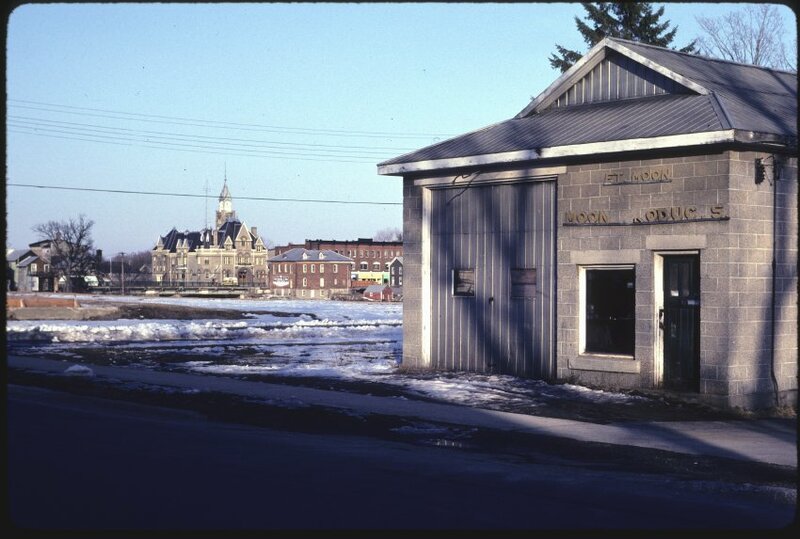 In 1946, after 21 years of business in Carleton Place, Bowland and Shannon sold Central Garage to Janice Louise Armstrong and a Mr. Lynch for the sum of $5000.00. The garage was sold fourteen months later in October 1947 to Mr. Melvin Ernest Kyer. He retained ownership of the building for only two years during which time he entered into a lease agreement with the Cities Service Oil Company. Mel Kyer sold the garage to Alfred Skillen in September 1949. Central Garage in 1949 was not a state of the art car repair business. The facility did not have a hydraulic jack. Instead a manual jack was used to raise either the front or rear end of the car. Mr. Ross McCall believes that Jim Miller had installed a hydraulic jack when he had leased Central Garage from Bowland and Shannon for his Dodge-Desoto dealership. Mr. McCall recalls that Miller sold the hydraulic jack to Vic Bennett who owned the Chevrolet dealership at the corner of Bridge and High Street. In the yard at the back of the building was a pit made of cement where oil changes and other under carriage work was undertaken when the weather permitted. The pit was very infrequently used and constituted a hazard that had to be covered by parking a vehicle over it. Alfred Skillen was not licensed as a Class A mechanic in Ontario. He hired Bert Guthrie a Class A mechanic. Bert had incurred an injury to his back which was aggravated from time to time especially when he would play baseball. His inability to always make it into work after a game, due to injury or perhaps the after game victory celebration, caused Alfred some labour problems especially when Bert had been in the middle of a job the day before. Austin cars manufactured in England were among the first foreign motor vehicles to be imported into Canada after World War Two. Alfred entered into an agreement with Myer’s Motors in Ottawa to act as a satellite dealer for the sale of the imported cars. To enhance retail opportunities he later entered into an agreement with the Studebaker Motor Company. Two Cities Service gas pumps were located under the second storey overhang at the front of the building along Bridge Street. In 1954, Alfred renovated the front of the building; the green and white Cities Service gas pumps were removed and the ground floor of the garage was extended by closing in the drive through area to form a showroom. Large glass windows were installed on the south and east side of the showroom. The restaurant was increased in size and extended along the front of the building. Skillen entered into an agreement with the Sunoco Company. A gas pump was located on College Street at the end of the garage. A Sunoco sign was hung from the front of the building. Alfred Skillen sold the business to Mr. John P. Andres in the summer of 1956 for $12,000.00. Thereafter the building was no longer used commercially to sell and repair automobiles. 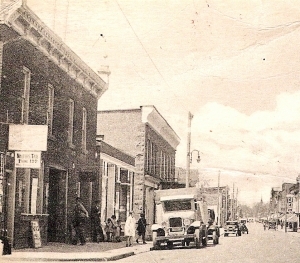 The red brick building was subsequently sold a few more times, renovated and housed small commercial businesses until it was eventually demolished about 1985. The foregoing is an excerpt from a more detailed research report by Terry Skillen that is available at the Carleton Place and Beckwith Heritage Museum. At one time, roads between early settlements were poor. The only means of travel was by horse and buggy, or by foot. The other method of travel was by water. The Mississippi River was an efficient method to transport people , goods, and services to communities bordering the Mississippi River and lake system. In the proceeding years other steamboats were built. The” Enterprise” built in 1869 was a larger vessel that was part of a larger plan to open a shipping company on the Mississippi. The plan was to build locks at Innisville, and Ferguson Falls to transport goods, lumber, manufactured cloth, and iron ore for shipment by rail from Carleton Place. Unfortunately, the scheme failed, and steamship “ Enterprise” was sold by auction in the spring of 1872. The purchaser was Peter McLaren, a local businessman, who used the vessel for next couple of decades transporting lumber. Mr McLaren did allow the boat to be used for social and for recreation when not in use for his lumber business. In the 1880’s to 1900, many other steamer were produced, and many built of thes vessels were built right in Carleton Place. They included the” Witch of the Wave” , “ The Morning Star” , “ the Ripple” and the” Mayflower”, The Carleton which was 80 foot long shallow paddle wheeler . 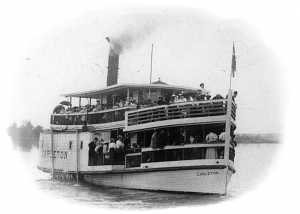 The “ Carleton” graced the Mississippi for many years. The Commodore was another of the larger steam vessels that made excursions up to Mississippi Lake. The popular Lake Park Hotel owned its own steam boat at the time which was called “Lillian B.” which was 40 feet in length. At the time, there was also smaller privately owned steamboats which were own by individuals and travelled up and down the Mississippi for pleasure and business. As the early to mid-1920’s steamboats began to fall out of favor as the gasoline engine and cars became part of our lives. Eventually,over time the great steam boats that graced the Mississippi disappeared. This ended a romantic chapter of travel, and pleasure on the Mississippi. The next time you are down by the river try to imagine the steam paddle wheeler “ Carleton “ steaming up the Mississippi River with passengers. The following is an excerpt from a more detailed research report on May Cornell that is available at the Carleton Place and Beckwith Heritage Museum. Mr. Skillen is a member of the Carleton Place and Beckwith Historical Society. He served on the Executive from 2004 to 2012. Terry hopes that by making the products of his research available to the Historical Society he will assist in keeping the history of our community alive. May Theresa Cornell, daughter of George Ambrose Cornell and Elizabeth Bourke, was born on 11 May 1877 at Carleton Place, Ontario. May’s father was a business man and the owner of income property on Bridge Street in Carleton Place and a farm in Beckwith Township. For several years, he was the owner of a wool mill in Pakenham. He was the property assessor for Carleton Place and a school trustee. May was the sixth of eight children in a family of four girls and four boys. May was the tallest of the daughters and perhaps the most interested in out-door activities. She was comfortable paddling a canoe and fishing from one; she was not squeamish about baiting and removing a fish from a hook. Her nephew, Peter Cornell, would remember May as the aunt who was always ready to participate in activities with him as he grew up. He considered her to be a woman of courage and action. After completing her elementary and secondary school education in Carleton Place, May trained in nursing at the Royal Victoria Hospital in Montreal. She worked at the RVH until leaving for Europe in 1915 to serve during World War 1 as a Nursing Sister. In July 1903, May was sitting on the river-front of her parents’ home on Moffatt Street when she saw a canoe tip throwing the four young paddlers into the water. Two of them could not swim. May reacted immediately by rowing to the site of the accident; one young man crawled into the boat and another hung on to the gunwale while May rowed to shore. William Genoe, when thrown from the canoe, did not come to the surface. He was found on the bottom of the river by Capt. Welsh, another rescuer in a boat. After twenty minutes of attempting to resuscitate Genoe, the lad began breathing. May was recognized for her heroic act in a letter sent to her by the Executive of the Carleton Place Canoe Club. 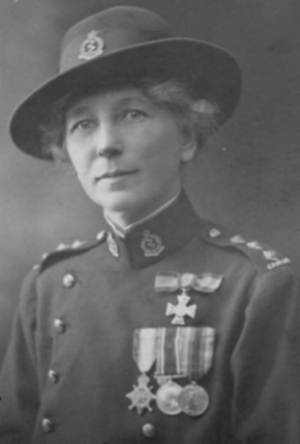 May Cornell was among the unmarried Canadian women who anticipated the need for Nursing Sisters to serve overseas during the First World War. She and about twenty-four other nurses arrived in England on 30 May 1915. May was a trained and qualified Nursing Sister; she was not a member of the Canadian Army Medical Corp. She probably intended to serve as an auxiliary nurse in a civilian nursing service to better her chance of being accepted into the Canadian Army Medical Corp. Arrangements were made with the British Red Cross to facilitate the placement of May and the other Canadian nurses in her group with a British nursing service. May was assigned to Queen Alexandra’s Imperial Military Nursing Service Reserve. She was given an allowance of £17. She wrote in her diary, “We are very proud to belong to Q.A.I.M. Nurses, Highest Nursing Order in England.” May was sent to Egypt where she served in hospitals at Port Said, Alexandria and on Hospital Ships in the Mediterranean. While serving at No. 17 British General Hospital at Alexandria, May met an Australian Army Sgt. William Walshe, severely injured in the Battle of Gallipoli in 1915. May served on Hospital ships from 1 May 1916 until early September 1916, when she returned to Canada “for a rest”. 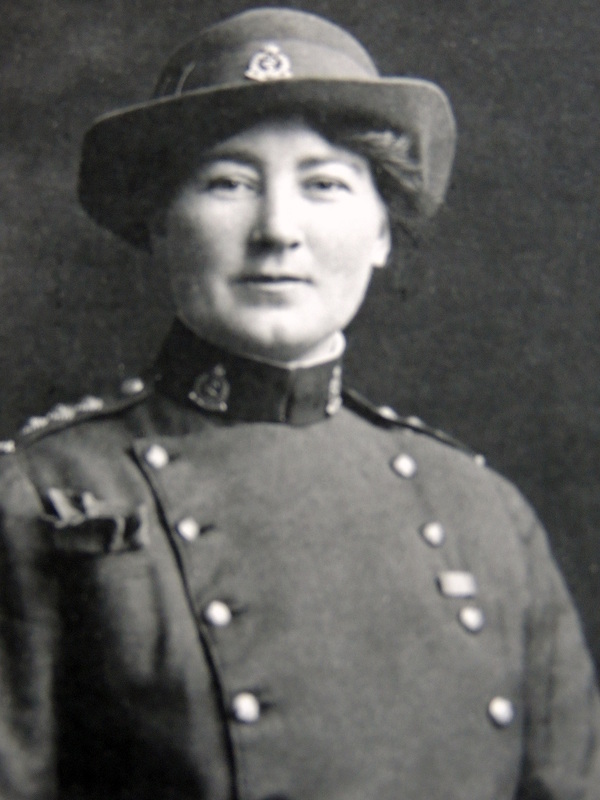 While in Canada, May joined the Canadian Army Medical Corp. She returned to England in January 1917, this time in the uniform of a Lieutenant Nursing Sister. May served in Canadian Army Hospitals until July 1919. In September 1918, she became the Charge Nurse (Matron) at No. 10 Canadian General Hospital (Kitchener War Hospital) at Brighton. May was promoted to the rank of Captain/Matron effective October 3, 1918. May returned to Canada in July 1919, after touring war torn france and Belgium with a group of Nursing sisters. May earned four medals: the Royal Red Cross, first class, the 1914-15 Star, the General Service Medal and the Victory Medal, in addition to four service stripes. She held the rank of Captain in the Canadian Army Medical Corps. She remained in Canada only five months before returning to London, England in January 1920 to marry William Walshe, the Australian soldier that she had nursed at the military hospital at Alexandria. They moved to Australia and resided in Melbourne. Sgt. Walshe was given a medical discharge from the army and a pension; William died in August 1928 and May returned to Canada in January 1929. May became employed by Mrs. Andrea Paton Robinson, a divorced woman of wealth, residing in Sherbrooke, Quebec. May became a very close friend of Mrs. Robinson over the long period of her employment. May returned regularly to visit her family in Carleton Place accompanied on occasion by Mrs. Robinson in her chauffer driven car. At other times May would be chauffeured in Mrs. Robinson’s car to and from Carleton Place. In 1935 May purchased her own car, a V8 Ford coach. May worked for Mrs. Robinson for many years. She seems to have resided with Mrs. Robinson at Rockmount even after her employment as a private nurse ended. Both the King and Queen spoke to Mrs. Walshe, questioned her about her medals and inquired where she lived. It was but another of the gracious human gestures that made Their Majesties visit to Sherbrooke an unqualified success and made an unforgettable impression on the city’s citizens and many thousands of visitors. When Mrs Robinson died in 1946, after a long illness, May returned to Carleton Place where she lived with her sisters, Nettie and Nellie. During the final years of her life, May’s cognitive functioning became impaired by dementia. She died at her home on Moffatt Street on 23 January 1957 at the age of seventy-nine. May was a member of the Victoria Order of Nurses (VON), the Royal Canadian Legion Auxiliary and the Catholic Women’s League. May was interred in St. Mary’s Catholic Cemetery in Carleton Place. Major Evelyn M. Wilson, R. N.
This article is dedicated to Iain Davidson, Past President of Legion Branch 192, Carleton Place. Mr. Davidson spearheaded the idea of including this important chapter of history on our community heritage website. The Town of Carleton Place is steeped in Military History. Many from our community voluntarily enlisted to go off to distant lands to fight for our freedom and democracy during WW1 and WW11. In fact on a percentage basis, we were one of the top communities in Canada to answer the call. One of our community’s greatest wartime heroes often referred to as ‘The Dynamo of Discipline’, was Major Evelyn Wilson. Although many of our own who enlisted during World War One were only teenagers or in their early twenties, she no doubt was one of our oldest citizens to enlist. She enlisted at the age of 37 in 1915 with the Canadian Over Seas Expeditionary Force as a Nursing Sister. At the time of her enlistment, she held the rank of ‘Matron’ and due to her outstanding service during the war, she quickly rose to the rank of Major. Miss Wilson was born in Carleton Place on October 5, 1877 to her proud parents, Martha and Joseph Wilson and was known as ‘Ava’. Her mother Martha Matilda Patterson was originally from Perth, and married Joseph Wilson of Carleton Place. Unfortunately, Evelyn’s father Joseph passed away at the early age of 44 when Evelyn was still a child of 10 years of age. Her mother remarried Dr. Robert Cavanagh of Carleton Place who no doubt was a factor in Evelyn taking up a nursing career. She completed her nursing training at the New York Post Graduate Hospital. She never married and was over ninety years old when she died. In her retirement, she had returned to her hometown of Carleton Place and upon her death, was buried in the Auld Kirk Cemetery along with her mother and step-father Robert. Evelyn’s prestigious nursing career led her to the Stamford Connecticut Hospital where she spent 27 years of her life. However, her 27 year career there was interrupted by the outbreak of World War One when she served in military field hospitals in France, Egypt, the Dardanelles and England with the Canadian Army Medical Corps, C.E.F. from 1915 to 1919. Due to her outstanding service, she was first decorated by King George with the Royal Red Cross (RRC), 1st Class for her devoted duty in Egypt and was awarded the Bar to the Cross two years later for faithful service under fire while in charge of Canadian Hospital No. 3 at Amiens, France. The Perth Courier of March 23, 1917 reported that “Miss Evelyn M. Wilson, daughter of Mrs. Robert Cavanagh of Carleton Place, has been decorated a second time. The second decoration appeared in the New Year’s honors as she received the Royal Red Cross and first class honors for her work in France where she was a Matron of the #3 Canal Stationary Hospital. In the King’s Birthday honors she also received honors.” Evelyn was actually one of only four people ever to have been awarded the Royal Red Cross twice. This was an incredible honor to have been bestowed upon her. Her battlefield leadership and innovated techniques were simply outstanding. She was a pioneer in the field of wartime medicine which gained her such respect that even doctors took orders from her. She was however also a dedicated humanitarian who took the science of nursing to all new almost unattainable levels. Evelyn once kept a field hospital in operation even though it had come under enemy air attack and the operating room at the field hospital had been destroyed. Her discipline and determination led fellow nurses and doctors to keep going even though they were surrounded by dead colleagues and patients. Many who were under her supervision actually feared her, but eventually ended up admiring her for all of her courage and determination. She was very fair in her dealings with all of her nurses and would show deep felt empathy in times of severe crisis. Although she could be quite testy at times, deep down, she was a very caring person. Miss Wilson was not only dedicated to her nursing career, but was also dedicated to her home town of Carleton Place. Upon her retirement, Evelyn along with one of the best known medical practitioners in the Ottawa Valley, Dr. J.A. Johnston, were the founders of the local St. John’s Ambulance Brigade here in Carleton Place. Dr. Johnston is also a former Mayor of the town of Carleton Place. Her love of the military and her community continued during her years of retirement when through to her dedication and commitment to our Veterans, she assisted in obtaining a Ladies Auxiliary Charter for the Ladies Auxiliary of the local Legion Branch #192 Carleton Place in December of 1944. Not only was she instrumental in establishing a Ladies Auxiliary for the Legion Branch, she was also the founding President of the Auxiliary. She held the Presidency for 1944 and 1945 and once again in 1948. It was due to her commitment and dedication to our Veterans, and the high esteem for which the Ladies Auxiliary and the local Legion Branch held for her, that an upstairs lounge was named in her honor as the Evelyn M. Wilson lounge. She was also inducted into Canada’s Veteran Hall of Valour in Carleton Place in 2005 which coincided with the 50th anniversary of the Carleton Place and District Memorial Hospital. There is no question that Major Evelyn M. Wilson most definitely earned her place in the history of Carleton Place as one of this nation’s greatest wartime heroes. 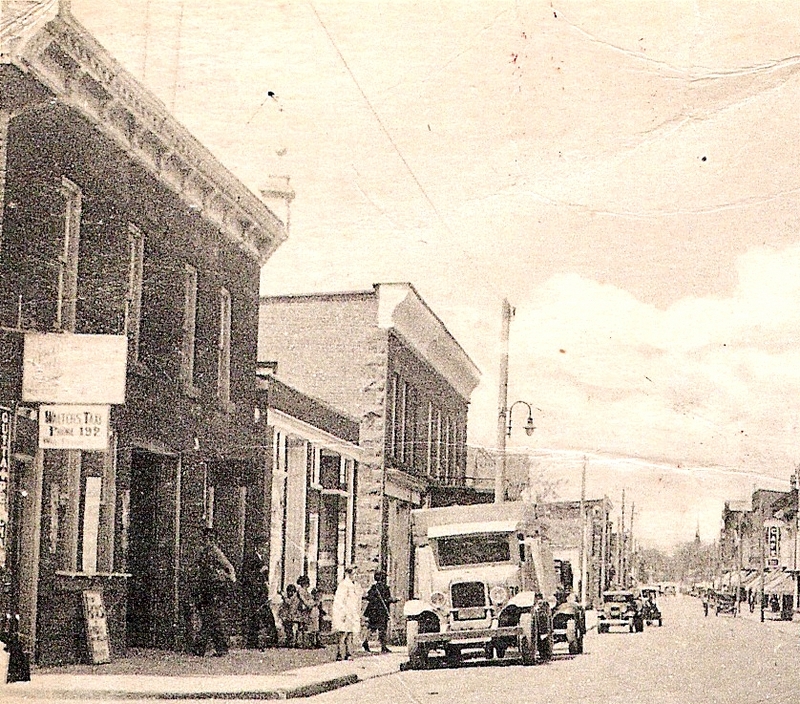 On Bridge Street in downtown Carleton Place just to the left of the Royal Bank once stood a two storey building that was home to the New York Cafe. The next time you are on Bridge Street look to the left of the Royal Bank and try to imagine the New York cafe in its' heyday. This is the story of a Chinese -Canadian family who made Carleton Place their home for many years. Mr. Lim Po Sing, who adopted the English name Harry Lim, was born at Victoria B.C in 1899. 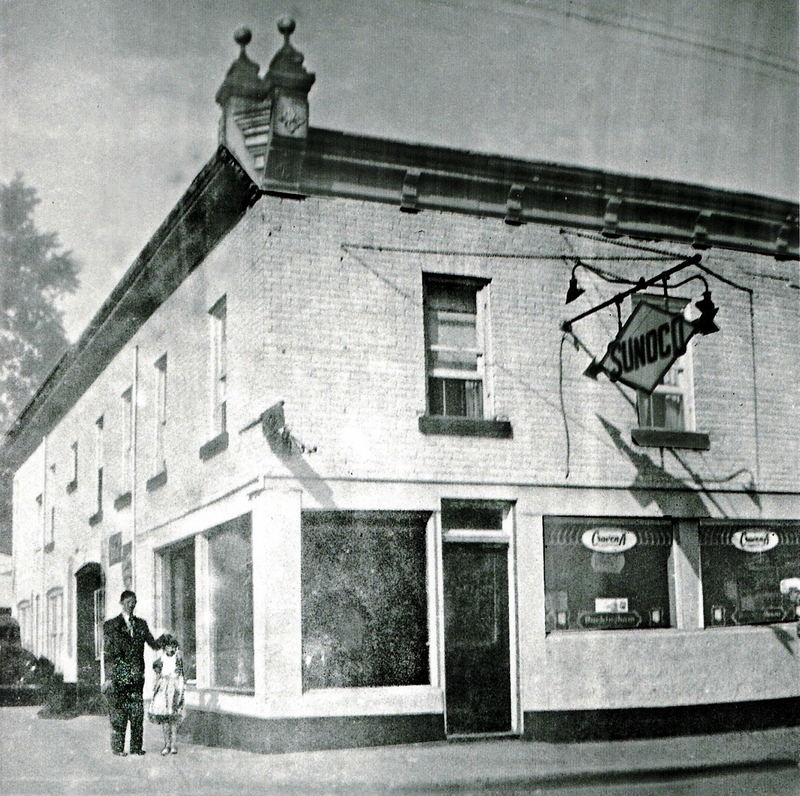 He came to Carleton Place in 1929 with the intention of establishing a restaurant business. His wife and their two children, Allan and Bill, returned to Canada from China and arrived in Carleton Place late in 1930. Harry took over the New York Café located in a two storey clap board building at 95 Bridge Street next to the Royal Bank of Canada. The building was owned by Oscar Okilman. At one time the building contained a clothing store called the House of Fashion. About 1926, Mr. Lee Wah rented the building from Mr Okilman, converted it into a restaurant and called it the New York Café, a name that evoked the atmosphere of a classy, big city establishment with catered to people with good taste. The name was well-deserved as a respectable establishment with a Canadian menu. The clapboard was removed from the front of the building and a very attractive set of double doors with clear glass windows was installed. Attached to the doors were panels similar in size to the doors that contained stained glass windows. Above the doors and panels were three elaborate stained glass windows. The entrance door was flanked by two large windows that allowed ample sunlight into the dining area. A window of similar height was positioned at the front corner of the cafe facing the bank. The curtains covering the lower half of the front windows of the cafe were a deep gold or gold/brown colour. A long exterior awning provided shade for the west facing front of the cafe. Upon entering the cafe, the patrons would see booths in front of them and to their left. A long counter ran almost the full length of the right wall. There were ten booths, five along the length of the left wall, four in the centre (think of a cross with a booth in each quadrant) and table #10 was a long family booth in the back right hand corner, beyond the counter. Harry Lim was the second Chinese tenant of Mr Okilman’s building. He placed advertisements in the Carleton Place Canadian to announce the opening of the cafe under his management in May 1929. Harry was competent in the English language; his wife, Lim Jung See, was unable to speak English. She did not usually work in the restaurant. Mr. Lim was both the manager and waiter of the small business. He worked long hours in the cafe, six days a week. The cafe was not open on Sundays. Mr. Lim would go into Ottawa to purchase produce for the cafe. The children were called upon to contribute their labour when they were old enough. Lim Po Sing spoke English well and without any accent. The family spoke mostly Cantonese amongst themselves, but all of them spoke English in their interactions with customers. Harry employed a Chinese man to do the cooking. The menu was mainly Canadian, no Chinese dishes. The clientele was drawn from town, from all walks of life, including people from the surrounding towns and rural areas, especially when there was a hockey, baseball or basketball game on in town. Patrons of the movie theatre across the street came in following a showing. During the Second World War people in army uniforms came into the restaurant because soldiers changed trains in Carleton Place, on their way north to Petawawa. Kay, the couple’s third child was born on 13 February 1931 a few months after her mother and brothers arrived in Carleton Place. The eldest child, Mary, remained with relatives in Vancouver until she arrived in Carleton Place at age eleven in 1934. 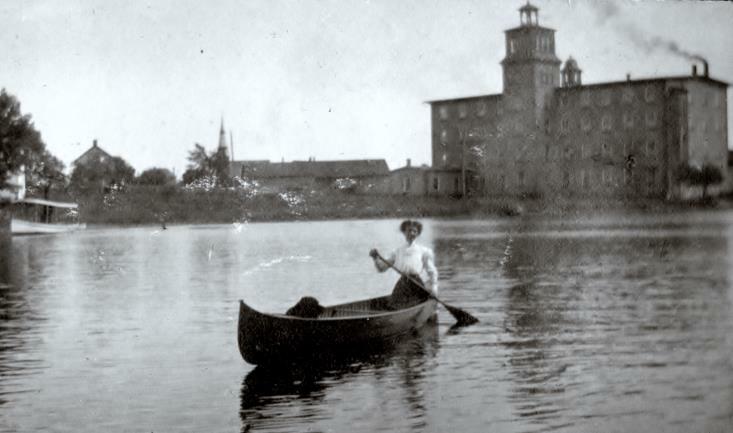 Mary did not speak English when she arrived in Carleton Place. All of the children when living in Carleton Place attended local schools. They did very well academically. Allen and Bill attended University of Toronto and graduated from the faculty of engineering, Kay graduated from University of Toronto and became an Occupational therapist; she married a Chinese engineer. Mary completed grade thirteen at Carleton Place and attended University of Toronto until her father became ill; she withdrew from school to assist her mother. Eventually Mary married a Chinese-Canadian engineer. 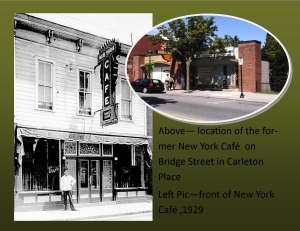 The Lim family lived above the cafe during their stay of twenty-two years in Carleton Place. They had to be frugal as did almost everybody in Carleton Place during the years of the Great Depression. The family’s living quarters included a living room, washroom, three bedrooms, even an outside veranda, but no kitchen. There was no need for a separate private kitchen, since it was quite easy to go down stairs and use the large (family) table for all meals where food and dishes were at hand. The building, up and down, was rented from the Okilmans, who owned the dry goods store near the bridge. There was adequate heat upstairs from the small wooden stove in the living-room but there was no air conditioning. It was hot during the summer day-time with nice breezes through the windows in the evenings. A veranda along the south side of the second floor of the building was accessed from the living quarters over the restaurant. The veranda faced the side of the bank next door; it was not easily viewed by those walking along Bridge Street. There were three windows along the front of the apartment. Two windows to the left of the large New York Cafe sign that extended from the building were for the living room. The single window to the right of the sign was for the master bedroom, as was the window around the corner facing the north side of the bank. Mr. Lim contracted tuberculosis; he was successfully treated at the Ottawa Civic Hospital and discharged home. He contracted pneumonia during the post-operative (pulmonary) period while still recovering at home. His condition deteriorated and he was hospitalized again at the Civic Hospital in Ottawa. Mr. Lim died on Monday April 8, 1940 in his 41st year. Mrs. Lim had worked minimally in the restaurant prior to her husband's death and spoke little English when she took over the business. Mrs. Lim carried on the business with essentially the help of a cook and the four children. Allan was not yet sixteen and in grade ten when his father died. Allan decided that it would be best if he left school after his sixteenth birthday and helped his mother at the café. Each morning one of the children typed up the menu for lunch and dinner. A regular menu was always on each of the ten tables in the cafe. Other duties assigned to the children were correspondence and business telephone calls including the placing of orders for supplies. Mrs. Lim hired local women to work in the restaurant. These women became wonderful friends of the family. The Lim children took turns helping also. Mrs. Lim hired employees from the town as each of her children departed for university in Toronto. Some of the employee’s surnames were Mrs. Tom Whelan, Mrs. Majaury and Mrs. Van and their first names Joyce, Margaret, Ethel and Jacqueline (Jackie). Not all, but most of the women hired by Mrs. Lim were widowed like herself. Their shared marital status helped to form a bond of friendship in the kitchen. Mrs. Whelan shed tears when Mrs. Lim announced that she would be moving away. They learned to communicate rather well in spite of the language barrier. After her husband died, Mrs Lim had increased contact with the townspeople, those who patronized the café as well as those who came in to the kitchen to visit and chat with her. She was always friendly and welcoming to all. There was always a pot of Chinese tea on the table. Mrs. Lim carried on the family café business until departing Carleton Place in 1951 when she returned to Toronto where she and her husband had established their first restaurant business and where members of her family were residing. She died in Toronto on 10 March 1980 at the age of seventy-nine. She was laid to rest with her husband in the Chinese section at Beechwood Cemetery in Ottawa on 14 March 1980. The ownership of the cafe was taken over by a partnership. In 1960, the New York Cafe was destroyed in a fire as was the Olympia Restaurant, in the next building, where in the 1920’s Louis Laskaris had the Olympia Candy Store. In 1958, James Laskaris sold the family business to Jim Antonakos. Howard Little’s Barbershop located in the building was also destroyed in the fire. 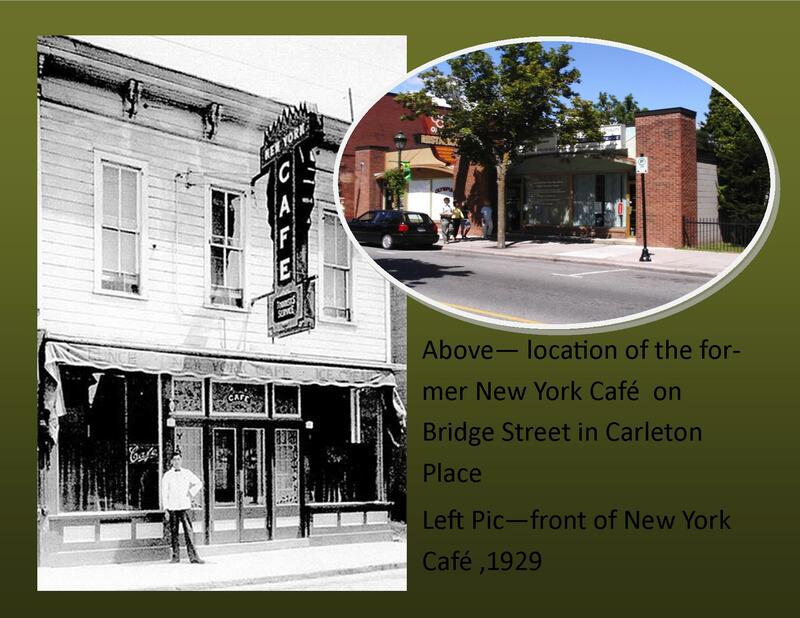 In 1961, Jim Antonakis constructed a one storey building on lots 9 and 10 in Section D where the New York Cafe once stood. The Olympia Restaurant was re-opened in the new building. In 2011, the building is still standing but the restaurant has been closed for over a decade. Today, if you drive on High Street in Carleton Place, and you approach the corner of Mclaren and High Street, you will notice a small residence. This home was once a busy machine shop, until it was converted to living quarters. The machine shop was owned for many years by Frank T. Moon. Mr. Moon's shop was on the north side of town but he lived in the large brick house on the corner of Lake Avenue and Neelin Street near the hosptal. Many locals will remember the sound of machinery working, and the sound of large belts and pulleys that were strung along the ceiling from machine to machine connected to large motors. It was a fascinating set up, with a true craftsman working behind the metal lathes,and other metal forming equipment. Mr . Moon was a short man with little round spectacles who worked each day forming, and shaping metal for his customers with pride. Along with general machining for customers, Mr Moon was famous for his turned brass candle sticks and his replica canons, he carefully crafted from brass and wood. Both the brass candle sticks, and replica canons came in various sizes. After completing each piece, he would carefully stamp a ¼ moon in the brass of each product that would indicate it was a genuine F.T Moon Product. It is said as Mr. Moon when in the latter part of his life , the moon stamped on the bottom of each product changed to a third quarter or techically called a waning moon. As a boy, I remember all the neighborhood kids would bike down to the shop and watch Mr. Moon work. As a kid it was fascinating to watch the large pulleys and belts moving along the ceiling of the shop. Mr. Moon was a kind man who always allowed us to watch at a safe distance or would stop to chat or answer our questions. The other memory, I have is Mr. Moon fixing the neighborhood children's bikes. If you had a bike problem , you would stop by the shop. Mr. Moon would stop what he was doing and access the situation. He usually fixed the problem on the spot for the kids but a overnight stay sometimes occured. He often joked with the parents that he was going to send out invoices for the work he did but never did. Mr. Moon was a part of our community for many years. I and many others will always remember his shop.. The photo for this article was supplied by the Carleton Place and Beckwith Heritage Museum. Please support our local museum.